Yess, we are going there. 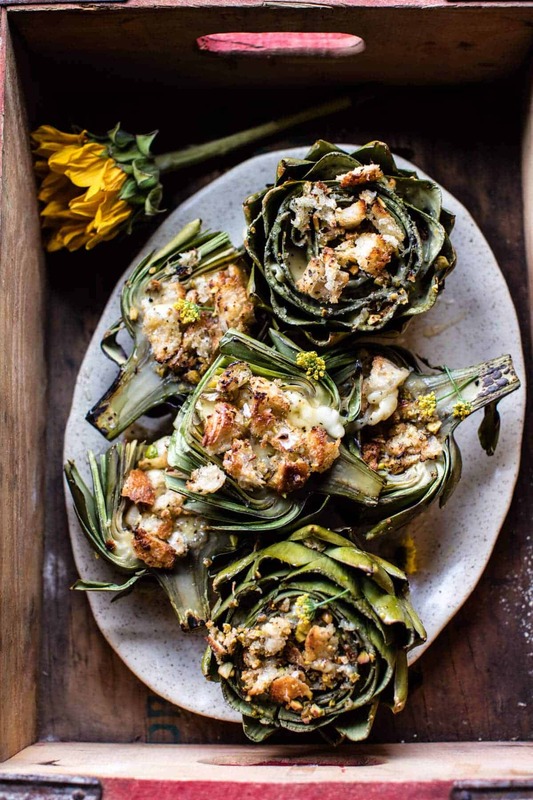 Buttery artichokes, brie, and sourdough breads crumbs. This is going to be SO flipping good. Oh wait, I already know this is so flipping good, but for you guys who don’t… this is going to be SOO flipping good! I’m a huge artichoke fan, like I love them, but they are one of the veggies I don’t eat on a weekly basis. Sure I’ll sometimes add them to pizza, or throw them in salad, but they don’t make the weekly cut. That’s kind of sad because every time I eat them I ask myself why I don’t I eat them more. However, today they made the cut, and I could not be happier about it. I mean, do you guys see that brie just melting out of that artichoke?!? OKok, I gotta go off topic here for a few quick seconds because at this very moment I have little Asher talking my ear off. I keep telling her that I am trying to focus, but she will have none of that. She is too excited. She just came over to show me her new look….red lips, curls in her hair….and a fancy little pink strip highlight mixed in with her blond curls. Yeah, my mom totally let he get a pink strip in her hair, and oh my gosh, you guys she cannot stop talking about it. She thinks it’s the coolest thing ever. She has been flipping and twirling her hair for the last thirty minutes, all while she’s filling me in on her very animal filled spring break in Las Veggies. Yeah, my parents took her to Vegas for a couple days for spring break. I dunno about you guys, but Vegas was nothing even remotely close to the spring breaks I had as kid. Seem like a weird place to take a seven-year old, but they only went to Vegas because it’s driving distance. Or well, I think the real reason they went to Vegas is more because Asher is a freak for animals and wanted to see the dolphins and tigers at Siegfried and Roy’s Secret Garden at the Mirage. She said it was so much fun and now she can’t stop talking about it. Guys, wow can that girl talk! Alright, now that she’s left, let’s get back to these Brie Stuffed Artichokes. I feel like a lot of people are afraid of raw artichokes, and I get it, they are a little scary, but the truth is that they’re really not hard to prepare. Promise, you guys can do this. And the brie, really the brie should make your decision easy. 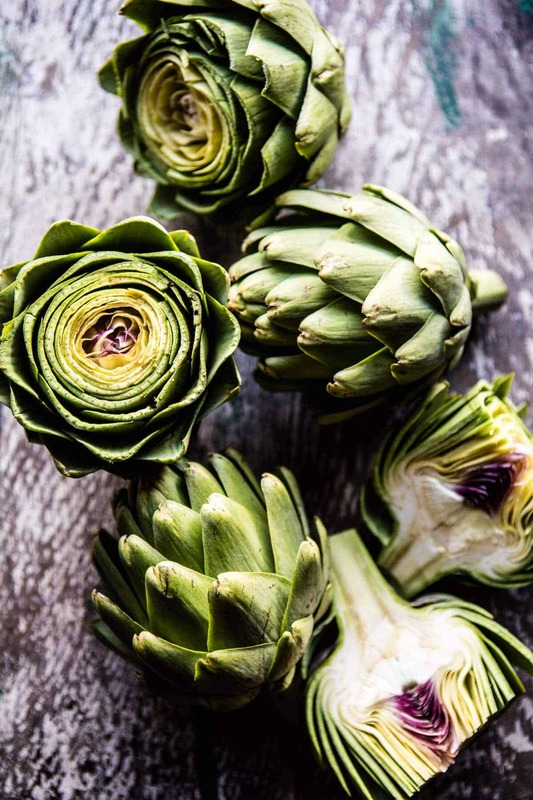 …start out by boiling the artichokes to get them cooked and make removing the prickly choke center easier. …while the artichokes are boiling, make the brie cheese sauce…YUM. …to remove the center of the artichoke you just need to take a spoon and scoop it right out, no big deal… I swear. I don’t have step by step photos for you, so I HIGHLY recommend googling it. Once you see a photo, you’ll be like ohhhhhh. …now stuff all that brie down, up and all over those artichokes. …top with the buttery sourdough bread crumbs. Just kidding, you can share, but I wouldn’t judge if you wanted these all to yourself, they are that good! Soo I made this recipe with Mother’s Day in mind. 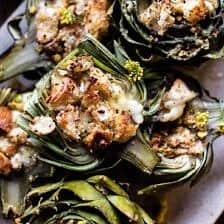 I know it’s still two weeks away, but I always have fun creating recipes Mom would love, and these artichokes are no exception. She has always been a huge fan of artichokes dipped in butter (obviously), so this just kind of elevates that concept. Cause I mean, brie and toasted buttered bread. Bring a pot of salted water to a boil. Cut the stems from the artichokes to leave a neat, flat base. Cut off and discard top one-third of artichoke. Place artichokes in boiling water and boil for 15-20 minutes, then drain upside down in colander. 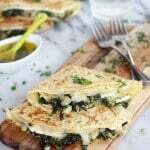 In a small sauce pan or skillet set over low heat, heat cream and brie, stirring occasionally, until smooth and creamy. Turn off heat and, while still stirring, add the egg yolk and the Parmesan cheese. Season with pepper. If desired, you can cut the artichokes in half or leave them whole. I think it's easier to halve them, but either way works! Place the artichokes on a baking sheet. 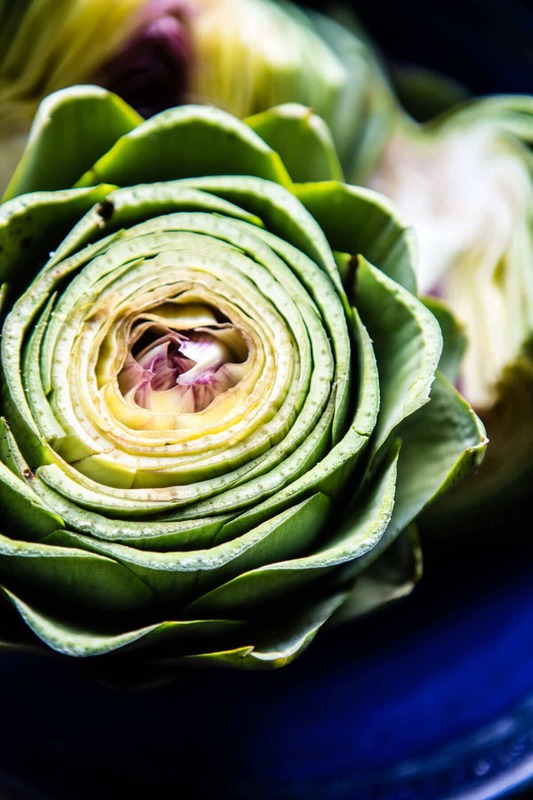 Press the leaves gently back so that the artichoke opens to reveal the inner choke and prickly purple leaves. Pull out the prickly white/purple leaves and gently scrape out the choke with a spoon. Gently pull the leaves outward from the center until the leaves open slightly. If you halve the artichokes, you just need to remove the choke and purple prickly leaves in the middle. 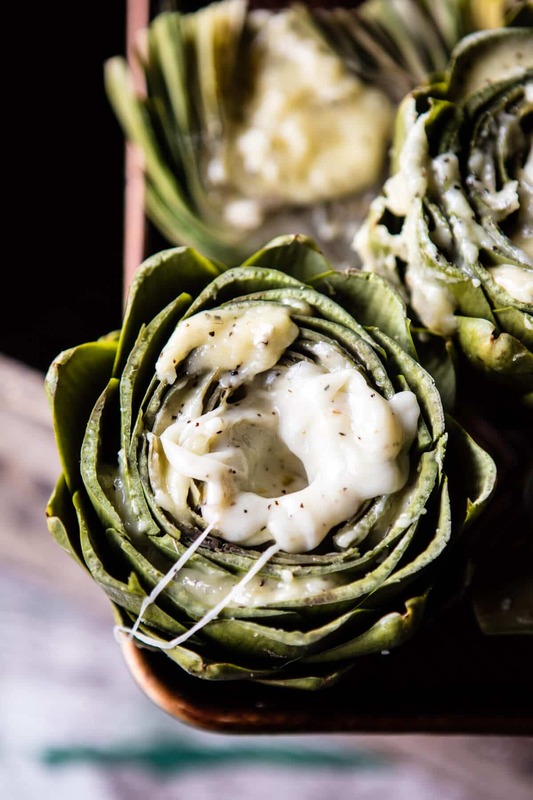 Fill artichokes with cheese sauce. Sauce should cover tops and fill into artichoke leaves. In a medium bowl, mix together the bread crumbs, pistachios, butter, oregano and a pinch of salt until well combined. Sprinkle over tops of artichokes. 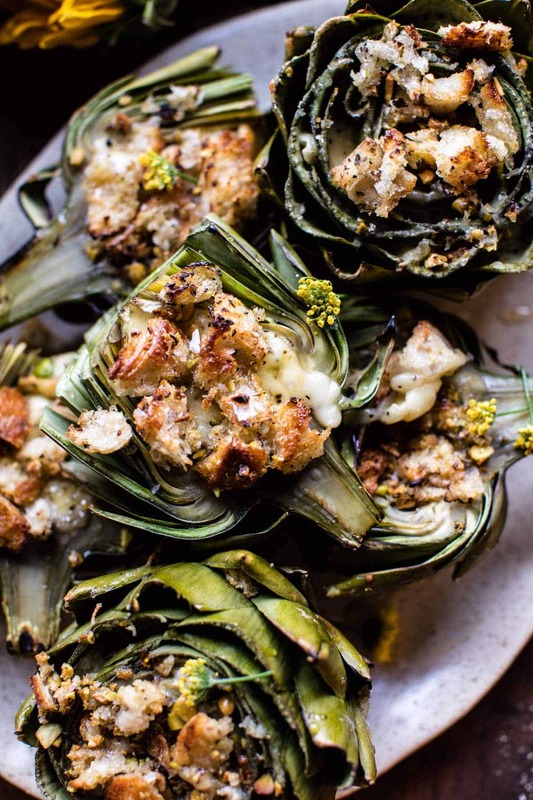 Bake the artichokes for 10-15 minutes or until the cheese is bubbling and the breadcrumbs are golden. Serve warm. 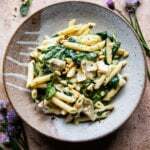 Lemony Spinach and Artichoke Brie Penne Pasta. 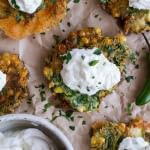 Spinach and Artichoke Corn Fritters with Brie and Sweet Honey Jalapeño Cream. i love the sound of a brie sauce! i bet it’d be amazing as the base for a fancy mac and cheese (: and i definitely need to start using artichokes more- they’re a little annoying to prep, but so tasty and worth it! Agreed! They taste great but can be a bit of a pain sometimes!! I hope you get to try Heather! Hmmmm yass!! This is so up my alley, have been obsessed with artichokes lately. And anything with cheese and breadcrumbs does really well in our house! I love the look of these and I really want to make them…soon! But I have what may be a silly question. I get the melted butter where you would dip the outside leaves and scrape off the meat. Does the Brie sauce stay soft enough to use in the same way? Any other hints you can give me? Hi Ed!! Not a silly question at all!! Yes you would eat them just like if you where dipping the ends in butter. You just scrap the brie off with the meat. So instead of butter, Brie!! Make sense? Let me know if you have any questions about it, it’s kind of a weird food! Hope you love these! Thanks!! ? 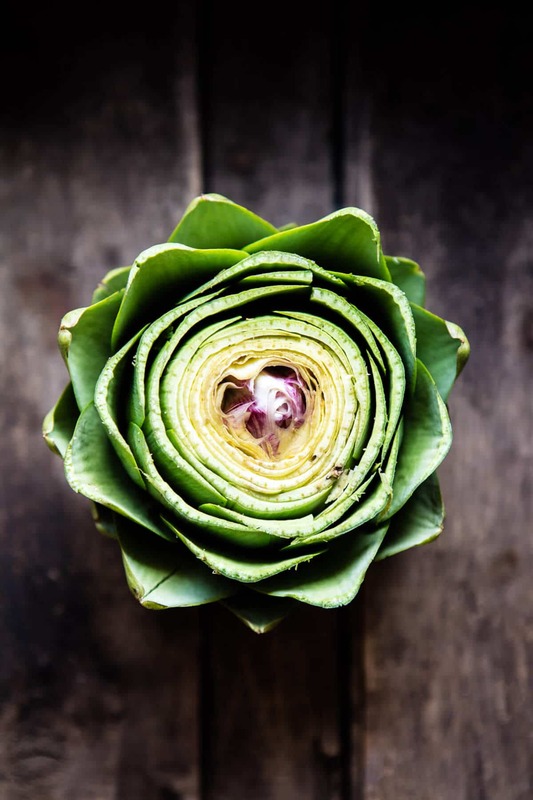 Artichokes are one of my favorite vegetables – and so gorgeous – and I so rarely prepare them!!! Must do something about that asap. Thanks for the inspiration Tieghan! Your welcome!! Thanks Laura hope you love them! They can be intimidating!! The brie is a plus!! Hope you get to try Christine! Love artichokes, love brie, and I basically have to make this immediately. So perfect! I mean, c’mon. These look INSANE. I want them in my mouth now! They are a must!!! I hope you get to try! Thanks Ellie! I love everything about these artichokes!! What’s not to love!?! Gorgeous! I’m completely new to raw artichoke. I mean, yeah, they scare the hell out of me. 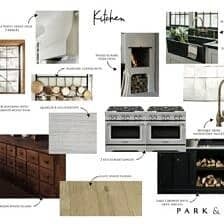 But this, oh my, i WILL make this ! Just a question, do you eat everything ? Sometimes i read to cut this part, remove these leaves, etc. You didn’t do any? Can you eat it all or you just use a spoon and eat the center while discarding the rest? Hi Erica! No you don’t eat everything. You need to remove the prickly choke before stuffing them with Brie and then once they are baked you just eat the meat at the ends of each leaf. Typically what people do is take their teeth to the meat and scrap it away from the meat. Sounds pretty weird but you will get once you give it a try! The leaves are not meant to be eaten and like I said that center part (the choke) needs to be removed as it is not edible. Promise it’s not at scary as it sounds. Let me know if you have questions. Thank you!! ?? Wow this is amazing, the brie, egg yolks, sour dough bread crumbs and baked till that bread is nice and golden brown. Lovely my mouth is watering. Great job. Omg, Tieghan! 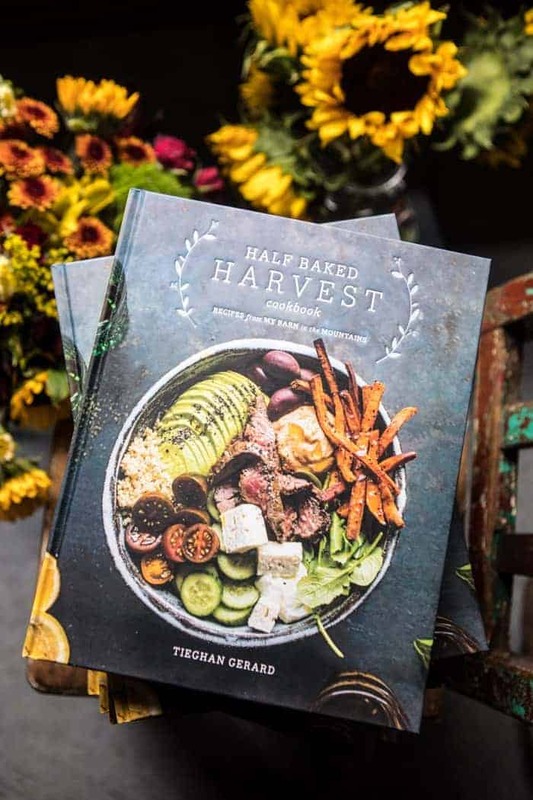 This looks absolutely amazing and I sooo cannot wait to give this a try! Thanks Andrea, Hope you love it! YESSSSS, this is genius!!! And your raw artichoke photos are dreamy..
How have I not thought of this before???? Yum! I dunno!! but I hope you get to try and love them!! We have artichoke hearts in salads occasionaly, but this looks and sounds really good. I will make it this weekend. LOVE those shots of the raw artichokes. They’re such a beautiful vegetable!! 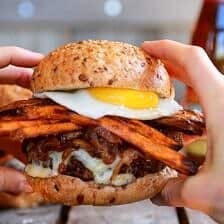 This recipe looks incredibly delicious! Yum!! Oh Brie, how I miss you. (I’m pregnant and can’t have Brie right now.) I lived in artichoke country for a couple years in middle school. Literally, our house was right next to an artichoke field. We had permission to pick artichokes and take them home anytime. I was a picky eater and afraid to try them. A couple years after we moved, I finally tried them and loved them. I regretted not eating them when we had unlimited access to fresh-picked artichokes. I have to make this after our baby is born! …or get my husband to. That’s a better idea, since I’ll be busy with a newborn and a toddler. 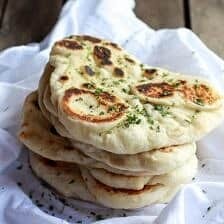 These look beautiful and sound just delicious Tieghan! Gorgeous photos! 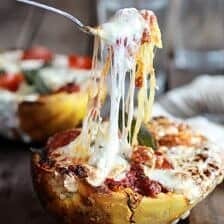 Awesome pictures, and love the recipe. Will definitely give it a try. Already bought artichokes. AWESOME! I hope you love it Victor! 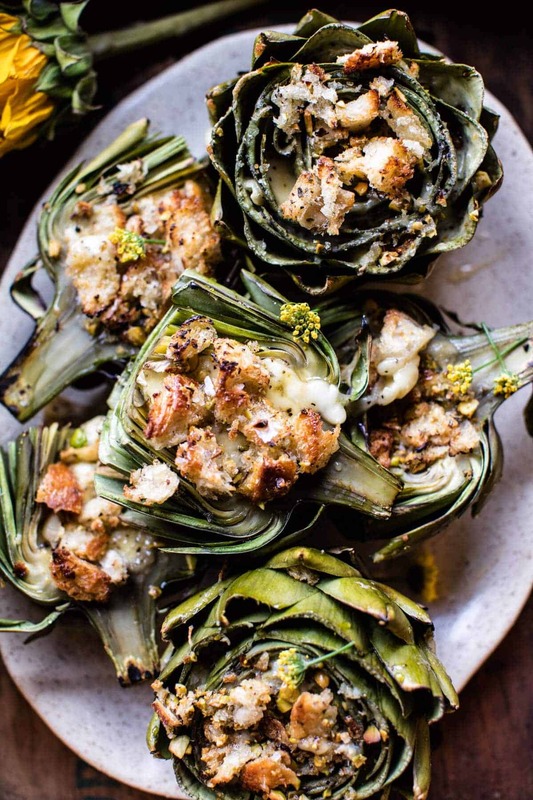 This sounds like an awesome new way to eat artichokes, I’ve only ever had them with vinaigrette or butter for dipping, can’t believe I’ve been missing out on artichoke with melty cheese for so long! What. WHAT. This isn’t even possible but it is! 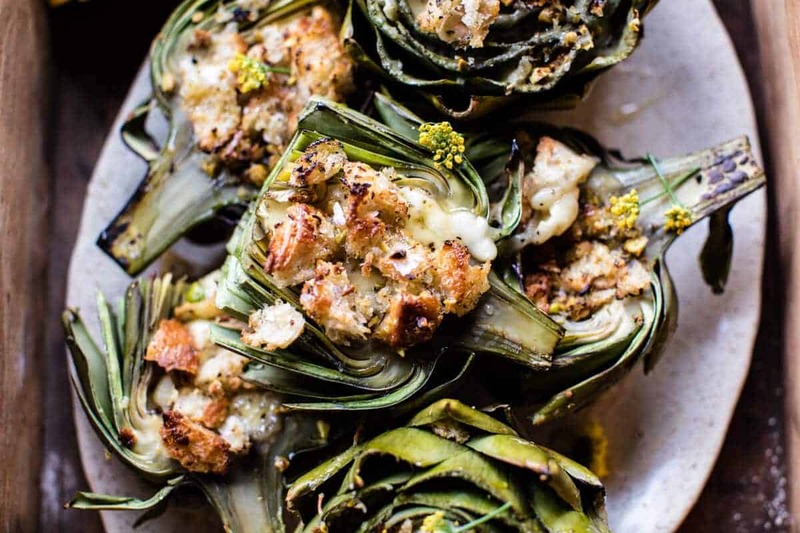 You’ve seriously set the bar for artichokes and for creativity HIGH. I don’t think I’d be able to top this–I bet that these artichokes taste even BETTER than they look, which says a LOT! Haha!! I really hope they live up to that !! Thanks Cassie! 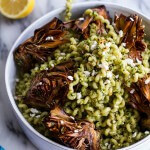 This is by far, the best whole artichoke recipe I have found. Brie is the perfect companion for the gentle artichoke. I like thinking outside the box and this recipe is creative and it inspired me. Boiling first, allows the choke to be easily removed and the remaining leaves and heart are still moist after baking. The crispy herbed nutty crumbs are like the icing on the cake. I’ll never understand why anyone would remove all the leaves just for the heart. What a waste. This is going to be one of those printed out, spilled on, yellowed 8X11 recipe pages that I hold in high regard. I’m also thinking about panko, ground cashews and fresh chopped parsley. Perhaps some garlic. But still – the Brie… And the whole artichoke. I am so so glad you love this Karen! Thank you!! This looks fantastic. When in season I buy baby artichokes at Trader Joe’a. No prickly choke to worry about. Extremely well priced and easy to prepare. I see honey in this recipe’ s ingredient list. When do you use it? 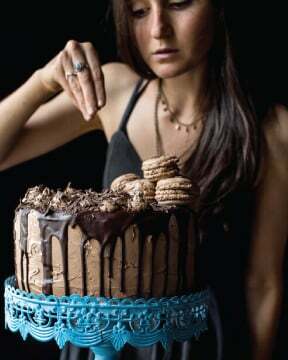 I will be making this very soon!